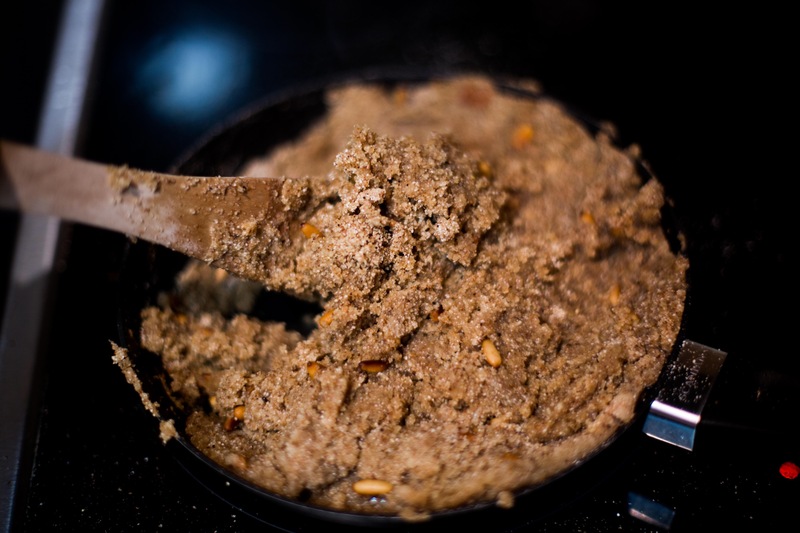 It is also called as Semolina halva. Originally, it is made with semolina, butter, sugar and pine nuts. However, I decided not to put oil and instead of sugar, I added pekmez (which is a thick syrup made by boiling down grape juice). If you don’t have it, you can use any syrup which will give sweet taste. You can also add sugar too. Merge pekmez and water in one glass (or add sugar into hot water). Put olive oil and pine nuts into pan and then stir the pine nuts on low heat until their color becomes golden. Add semolina and cook over a very low heat, stirring all the time until the color becomes dark golden brown. Add syrup very slowly into pan and while stirring. Mix them and stir continuously until the water is absorbed. Allow the dessert to come to room temperature for 15 minutes. Put them into plates and enjoy !